Wellington - The West Indies received heavyweight support on Thursday ahead of their Cricket World Cup quarter-final against New Zealand with former greats Brian Lara and Andy Roberts both tipping an upset. Home side New Zealand, unbeaten through pool play, are heavily favoured to win Saturday's knock-out match in Wellington and go on to play South Africa in the semi-finals. 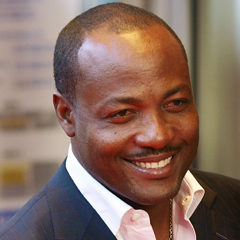 But Lara said he was "patriotic and optimistic" the West Indies "have the armoury and the personnel" to win. "Obviously, the West Indies are going into that match as underdogs but I believe there's a chink in the armour of the New Zealanders," he told Indian broadcaster NDTV, noting New Zealand fell apart in the play-offs last time they co-hosted a World Cup in 1992. But Lara wants a shake up in the West Indies line up with Johnson Charles, who scored 55 when called up as a late replacement for the United Arab Emirates game, to replace Dwayne Smith as Chris Gayle's opening partner. Denesh Ramdin or Lendl Simmons should be promoted up to number three to anchor the innings should Gayle produce his renowned fireworks, Lara added. Former fast bowler Andy Roberts also believes New Zealand can be toppled if the West Indies set aside the significance of the occasion. "Don't get too intense because when you get too intense you shrivel up and you know we are famous for that because sometimes we have victory in sight but end up losing," Roberts told the Daily Observer in Antigua. "So all these guys have to do is to just be themselves and be confident that they can do it. If you think New Zealand is going to beat you then you know you are going to get beaten."